So basically, everyone is just going to have to deal with me and my obnoxious construction posts/pictures. I understand that other than Kurt and I, no one else probably cares about our new home but let’s face it, this is my blog and I’m going to do what I want! Haha! So you’ll all just have to bare with me until the end of October. Once we’re moved in and all settled, I highly doubt I’ll want to post any more pictures because I can almost guarantee within a week it’ll look like a bomb went off. I anticipate getting maybe five days of a clean house before the whirlwind that is my almost two year gets a hold of it. 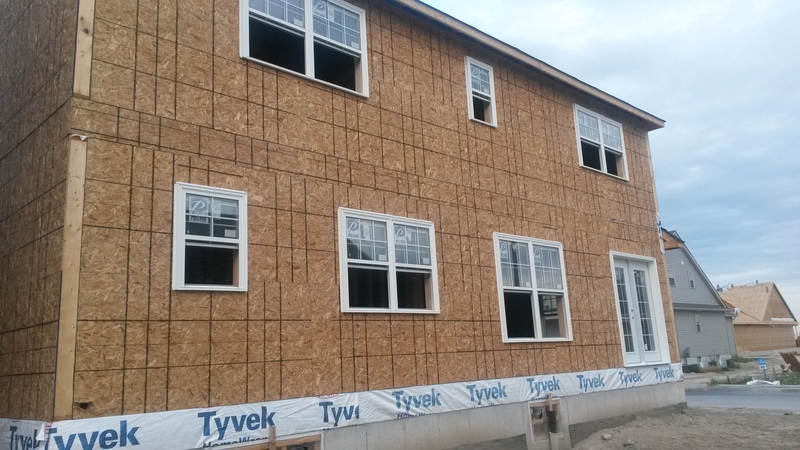 The three of us drove up last night to see the progress since my mom had informed me that we had windows installed now. There hadn’t been a whole lot of progress in the last two weeks so I was looking forward to seeing some more construction completed. 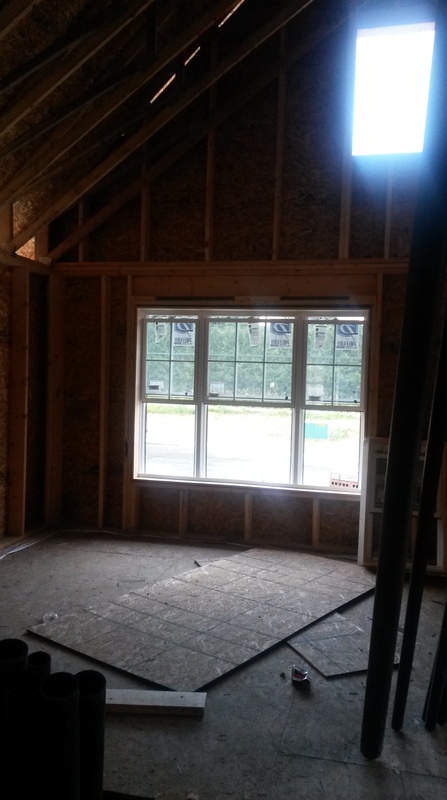 I find once windows are installed, the house starts looking more and more like a home. 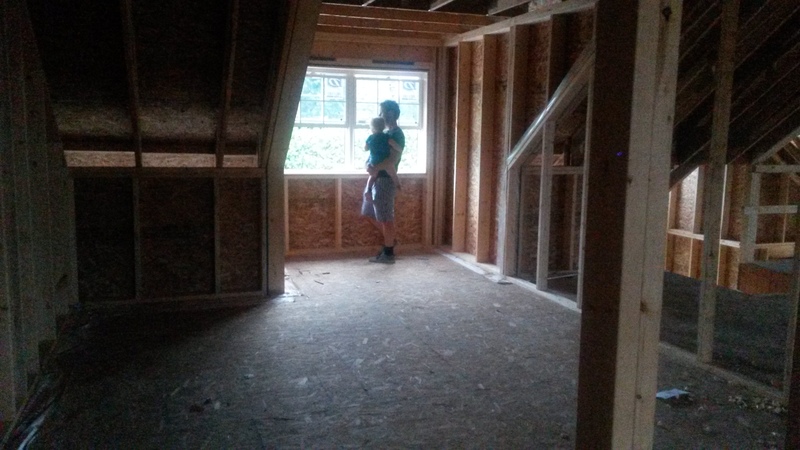 I know there’s still a whole lot left to be completed but seeing the windows go in makes me dream about all the natural light that will flood our home while I’m cooking breakfast or playing with Nate or relaxing in front of the fireplace with Kurt. We also got to meet the neighbours behind us. When you move, whether it’s to a new build community or a resale house, you never know what to expect when it comes to you neighbours. In Kurt’s very first house he owned, we had a wonderful elderly man on one side of us and unfortunately, on the other was a not-so-wonderful middle-aged man. When we moved, we were so relieved to be getting away from him. I can’t even begin to express how much we disliked him and how rude and ignorant he could be. Thankfully, when we moved into a our current home, we were blessed with amazing neighbours on both sides. We’ve never had issues with either couple living beside us and in fact, if we could we’d bring our neighbour on our left with us. He’s just the friendliest man and any time he goes out East, he’s always bringing us back yummy goodies. We’ve had a good two pounds of moose meat given to us, at least five massive lobsters, and a 1L jug of pure maple syrup that I’m not sure we’ll ever be able to finish. He even cuts the grass in between our houses so we don’t have to. If we could, Owen would most definitely be moving to our new neighbourhood with us. But alas, that won’t happen so instead we’ve been trying to meet our new neighbours whenever we head out to see the house. The couple living directly beside us is a super sweet elderly couple with a grandson about Nate’s age and then the couple behind us are middle-aged husband and wife who we chatted with for about 20 minutes last night. They were really taken with Nate and assured us that they won’t let their dogs out unattended when we move it; which was definitely reassuring. We chatted about potentially putting in a fence with them when we move in and they pointed out houses in the area that also have small kids. It was a welcome relief to know there are quite a few young families like us in the neighbourhood since we were a little concerned we might be the youngest family. All and all, everything is coming along nicely! Now if only I could find the energy to start packing up some of our belongings! Looking good! Just missing one teeny tiny window that will let even more light into our beautiful dining room! Kurt really wanted a large wrap around front porch but unfortunately the only elevation we could choose didn’t allow for that. I’m pleasantly surprised with how the porch is looking now though. It might not be a wrap around but it’s at least a bit bigger than what I was originally thinking it would be. 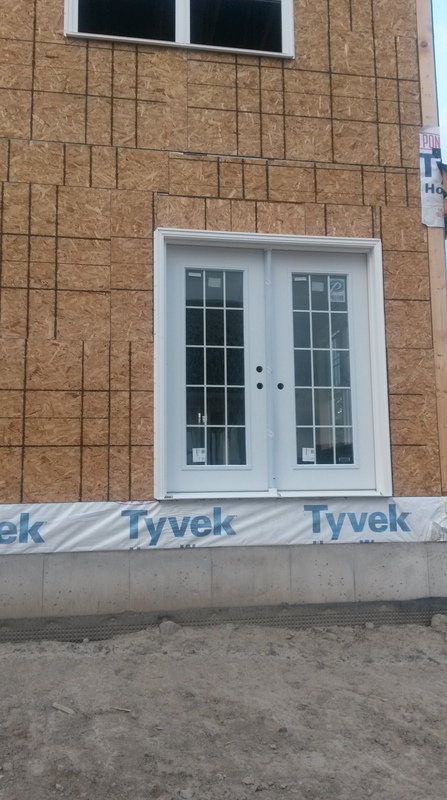 Kurt’s dad was adamant that we choose garden (French) doors over the standard sliders. I’m really happy he pushed us so hard to make this choice. I think we might be the only house on the block, if not the neighbourhood, with them. 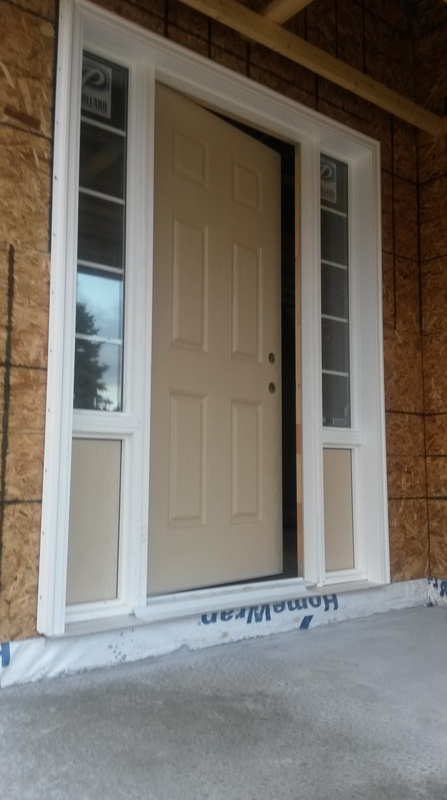 The lady at the design centre said they only had one option for garden style doors and that no one had ever asked for them to be installed so leave it to us to be the first to ask for them on one of the very last houses they’re building for phase 3. Windows, windows everywhere! I’m so looking forward to all the natural light that will come through these babies. Side note: I’m so not looking forward to the price it’s gonna cost us to buy window coverings for all these babies. 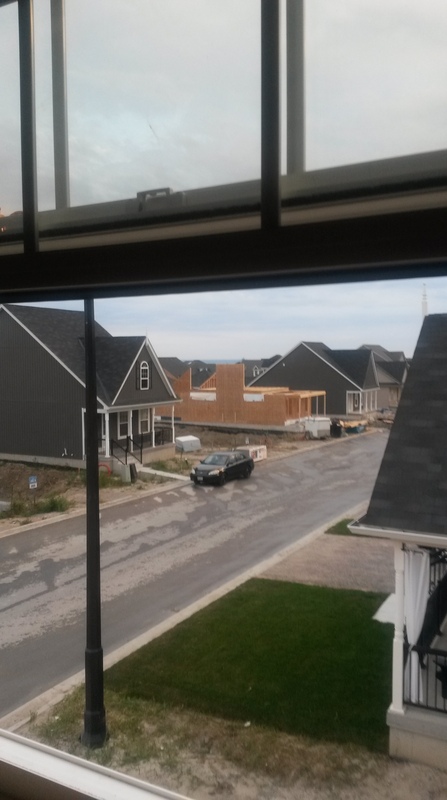 The view from where our kitchen island is going to be looking into our main living room. 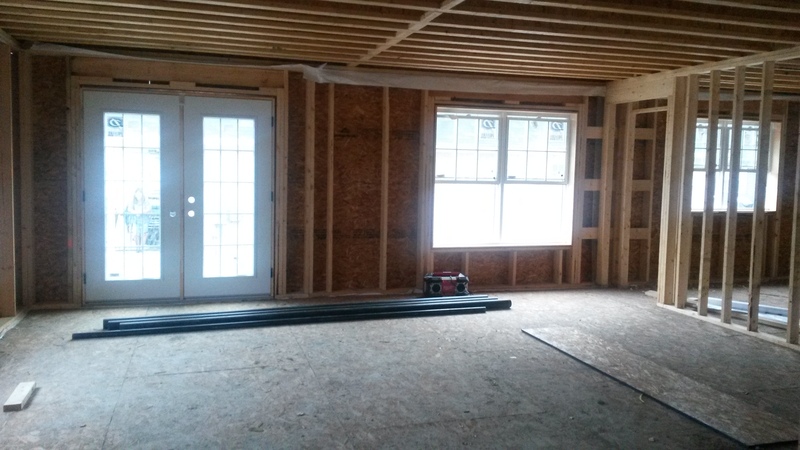 In between the doors and window is where the gas fire place will go and our master will be right off of this room. 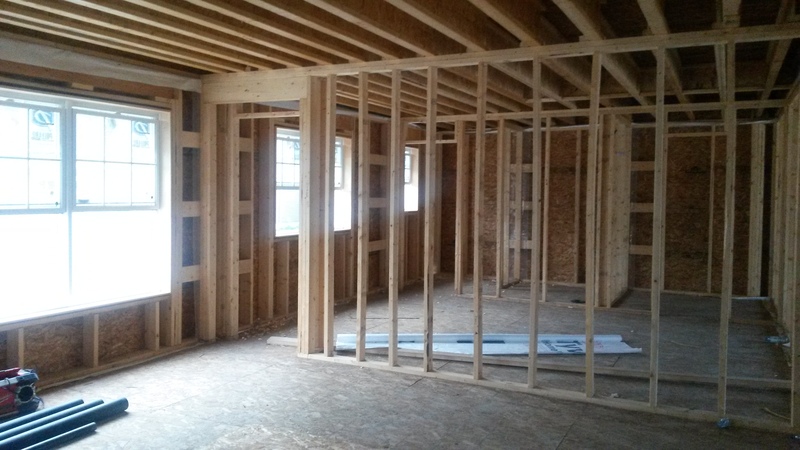 Speaking of our master, this is the view (for now) from the living room into our bedroom, walk-in closet, and bathroom. It’s hard to tell without dry wall up but it does seem a bit smaller than what I was thinking it was going to be as per the measurements on the blue prints but I’m a firm believer that a bedroom is just where you sleep regardless of if it’s for Nate or us, I’d rather allot more space to the common areas like the kitchen and living room. 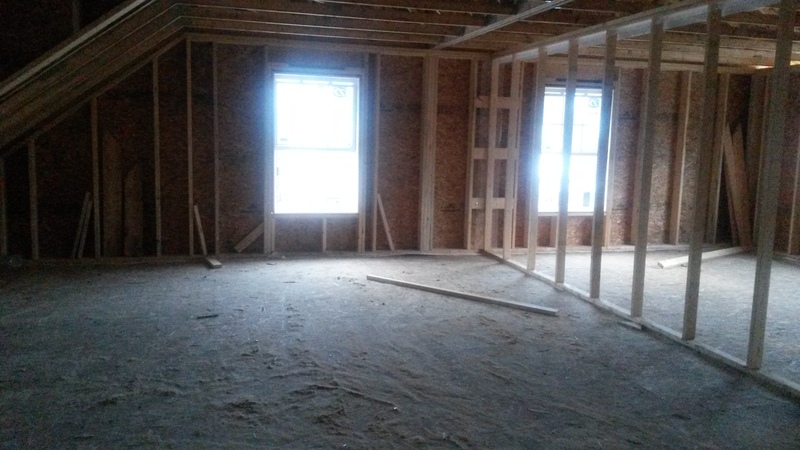 The view of our soon-to-be walk in pantry. 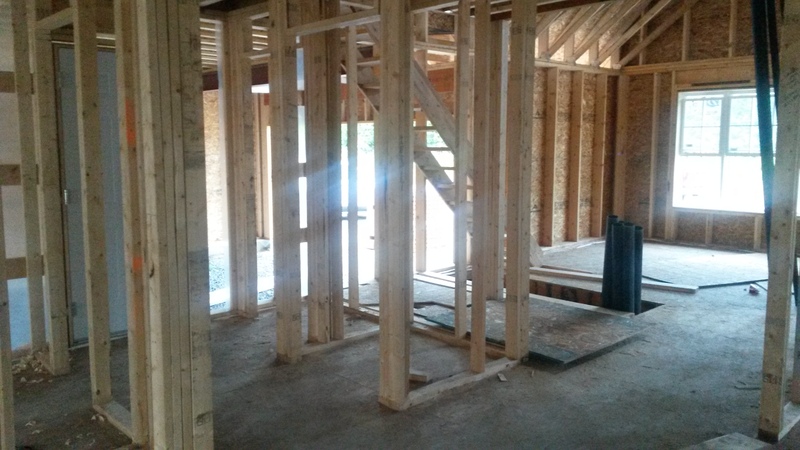 Beside that will be a closet, then the garage door and across is a half bath and a small broom closet. 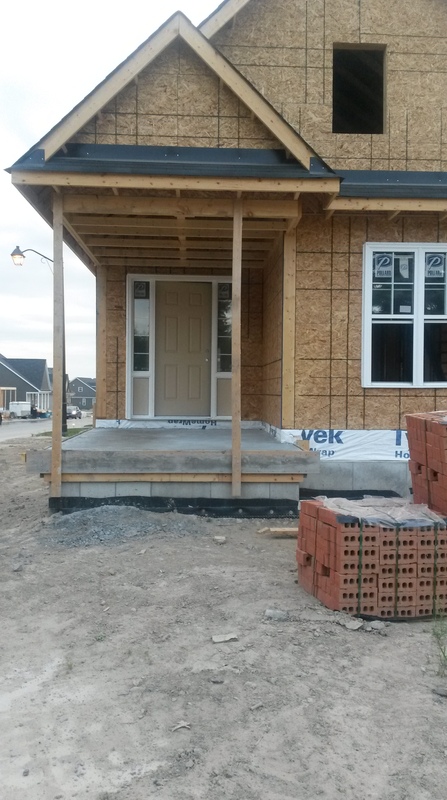 There’s also the opening for the stairs that will lead to the basement and where the window is will be our dining room with a vaulted ceiling. A not-so-great photo of the dining room. This is the room I think I’m most excited for. 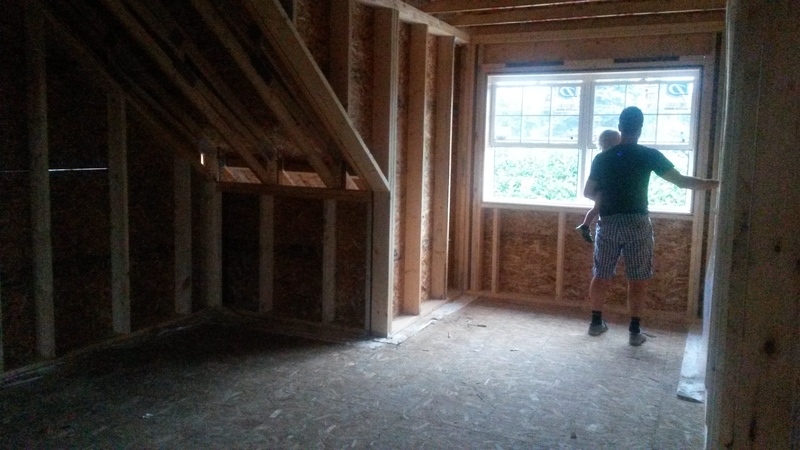 This will be our upstairs ‘loft’ space. I plan on using this space to create a fun, and whimsical play room for Nate and perhaps any future children we might have. Last night I was trying to create a lay out in my head of where I think everything should go. I’d love to include an arts and crafts table with an area to hang up artwork, an area for his tee-pee and ‘fake-out camp out’ toys to go, a spot to relax in front of the tv, and if we’re lucky and have enough room, maybe even a ball pit. I know it sounds extreme but that’s the point. I wanted this house specifically for this upstairs bonus space so why not go all out on it? I really don’t want to ever move again, unless we’re retiring to the lake so this will be the home Nate grows up in. I want it to be everything I imagined it to be. 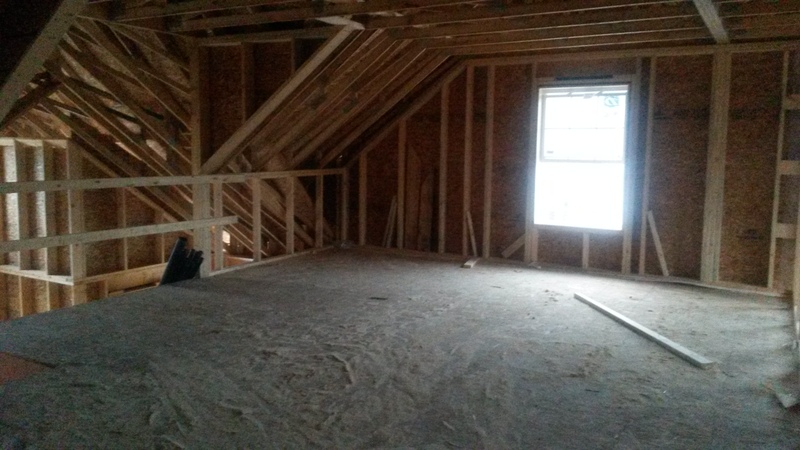 Another view of the loft area. I’m thinking a little arts and crafts nook would be perfect in that sloped wall space. What do you think? Nate and Daddy checking out the view from Natey’s new bedroom. We cannot believe how large his room is. Kurt is convinced it’s bigger than the master. He has a large room now but this makes his current bedroom look TINY! I definitely have BIG plans for his room too. I know we can’t paint for about a year but that won’t stop me from decorating like crazy! I envision a little desk in the sloped area and a big reading nook in the window bump out. Pillows, bean bag chairs, comfy-cozy blankets. You name it, I think a reading nook should have it. We’ll put up some ledges for his books and it’ll be the nicest spot to go to for some quite time. Just another view of his bedroom to show just how large it really is. Boy is gonna have SOOO many play areas! The view from the loft area. You can just make out the water against the cloudy sky. On a clear day, this view is amazing. 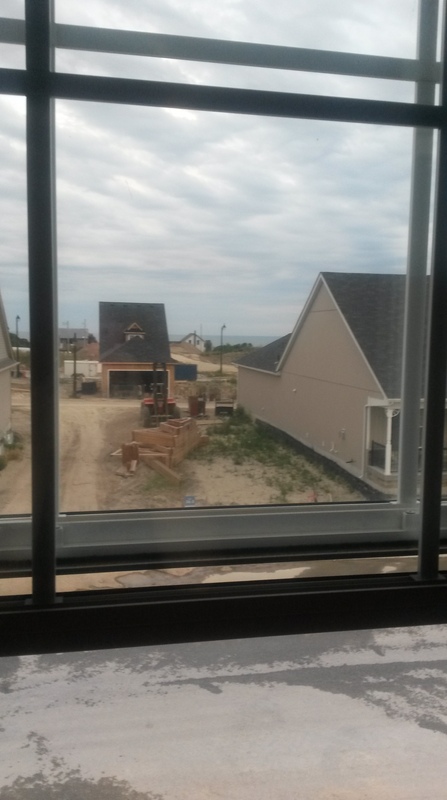 I’m really hoping that the house that is built in the empty lot across from us won’t completely obstruct the view of the water. Fingers crossed! And last but not least, these two pictures are of the views from the two windows in our fourth bedroom. Again, on a clear day, you can see the water which is just beautiful. 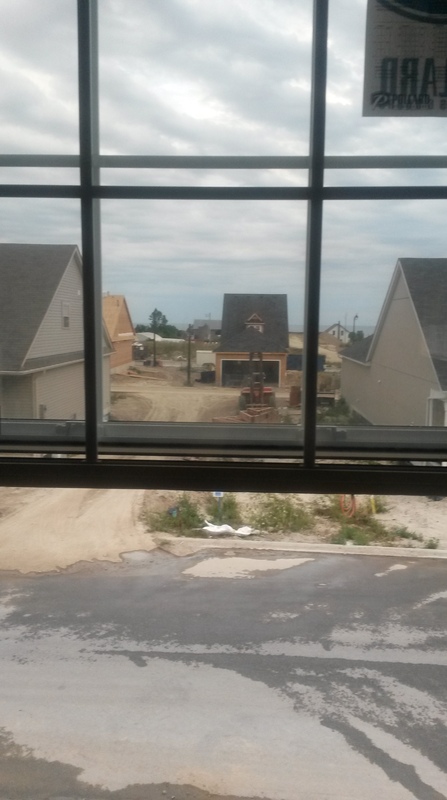 The best part about this room is that no matter what, you’ll be able to see the lake over the houses. Ahhhhhhh!!! I’m so excited for this next chapter is our lives. 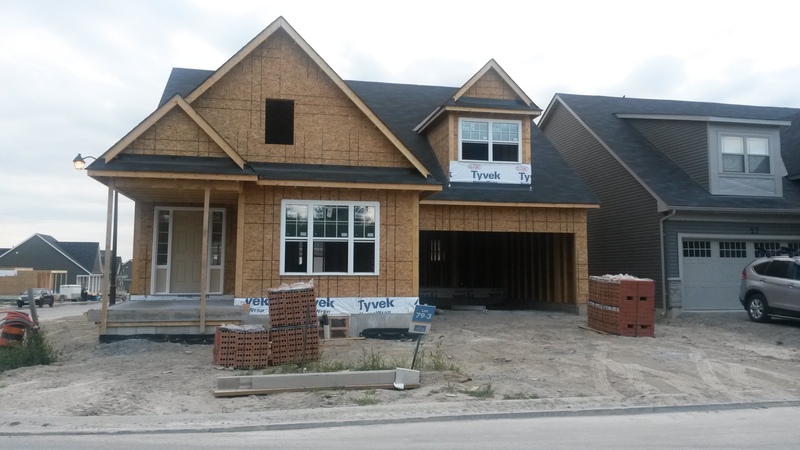 I’m already dying for Autumn to get here because I’m so sick of this heat and now seeing the progress on our home, it’s making me wish it was October even more!